Can you confirm these amateur observations of Panaspis maculicollis? Type locality: Klein Tshipise, Mutale District, Northern Province, South Africa. Types Holotype: TM 76922, an adult male. Diagnosis Diagnosis. 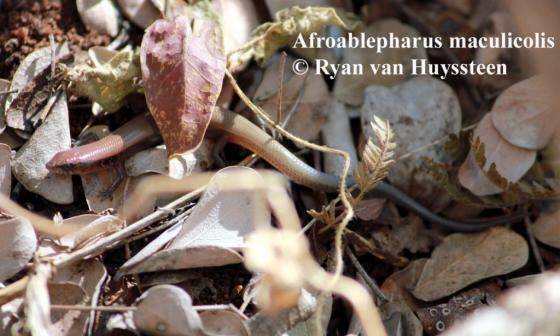 A small slender species of Panaspis with an ablepharine eye; no supranasals; frontoparietals fused; mostly 26 scales at midbody and conical palmar tubercles. 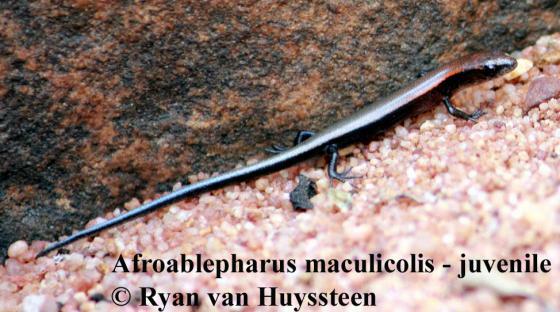 Males exhibit a blackish patch on the side of the neck in which vertical or diagonal lines of white spots are spaced at intervals of 2-3 scales; when in breeding condition males have orange colouration restricted to chin and throat (i.e., the converse of the colour pattern in male P wahlbergii from the Bazamto Archipelago). Etymology The specific epithet refers to the spotted neck, characteristic of adult males.